Saturday March 29th 1884 Lee is twenty two years old today. We got the work done up early and Hatt and Win came over with the children. Hatt was sick all day. We took care of her and the children. She was able to go home before night. I went over after supper and Win came home with me to stay awhile. We got a new boarder today. 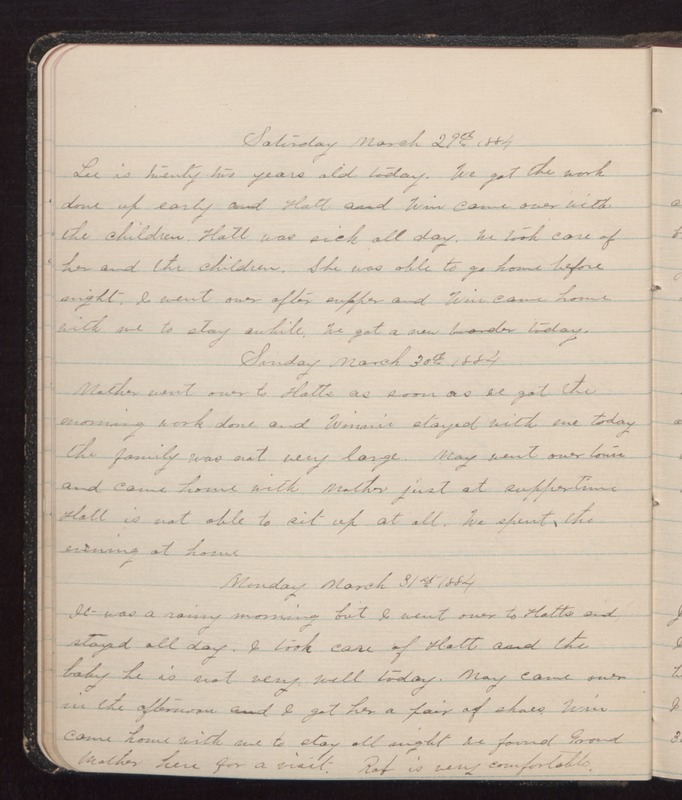 Sunday March 30th 1884 Mother went over to Hatts as soon as we got the morning work done and Winnie stayed with me today the family was not very large. May went over town and came home with Mother just at supper time. Hatt is not able to sit up at all. We spent the evening at home. Monday March 31st 1884 It was a rainy morning but I went over to Hatts and stayed all day. I took care of Hatt and the baby he is not very well today. May came over in the afternoon and I got her a pair of shoes. Win came home with me to stay all night we found Grand Mother here for a visit. Rob is very comfortable.